This Halloweenn, instead of a toss away disposable bag or a big space invading plastic pumpkin, why not try something more compact and sustainable for trick-or-treating!? ChicoBag Reusable Trick or Treat Bags are made of durable woven polyester and are reusable, year after year. The special lightweight fabric allows for easy opening by your child and the bag expands easily to hold a ton of Halloween loot – 25 pounds in all, if your little one happens to be so lucky. No special folding is required. Once the bag is empty, it stores away nicely, taking up almost no space at all. Bags can be machine washed on cold and after Halloween your child can use this bag at the store on shopping trips. 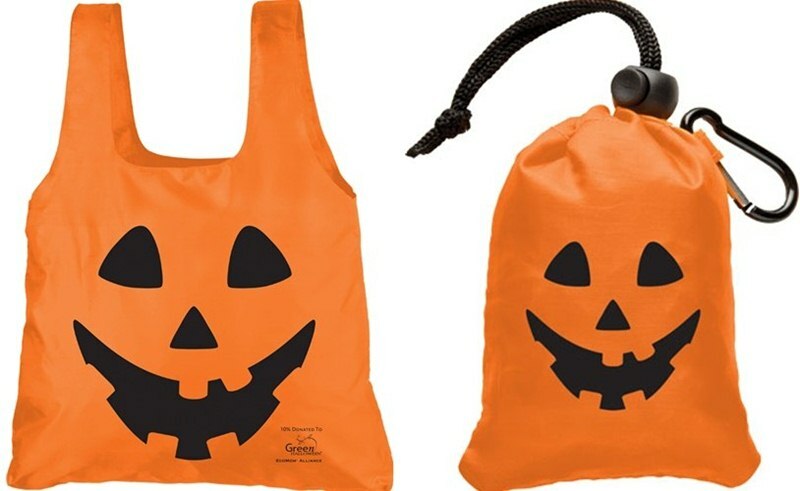 Reusable Halloween bags are a great way to teach your child about reuse and keeping it green. Plus with so many fun designs to choose from, your child is sure to fall in love with one or more of these bags, and since they’re totally affordable, that’s no problem. To add to the coolness, the Frankenstein, Purple Ghost, Haunted House and Skull bag all feature glow in the dark ink. Best of all, 10% of the sale of each bag will be contributed to Green Halloween®, an organization helping to make a Green Halloween possible!